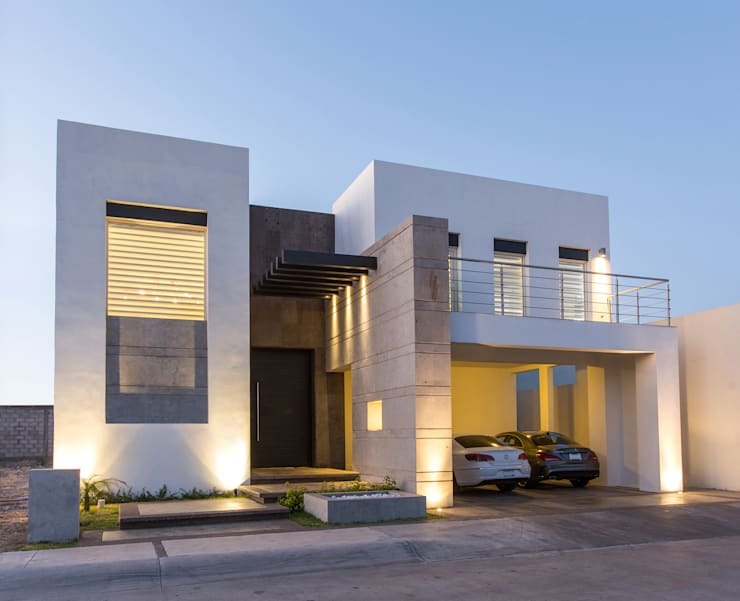 Mexican architects, Grupo Arsciniest, have taken a modern family home to the next level with this stunning piece of architecture that capitalises on strong clean lines and a minimalist style. Think white, light and bright. 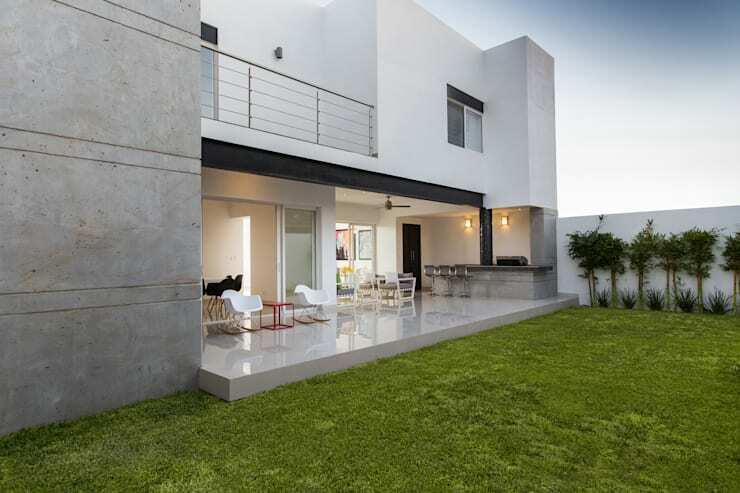 Chic and sleek, this is the type of house that would suit a Johannesburg neighbourhood or a suburb in a coastal town. It's designed for a family that embraces trend and style but don't want to give up on comfort and cosiness in the home. This is the perfect house to get you inspired to make some much needed changes to your own house. Even if it's little touches here and there, you can make a huge difference to your home right now. Follow us on a tour that will change how you see modern family homes! When we see the exterior of this home for the first time, which is nicknamed Casa RR8, we see the sleek and sophisticated look straight away. First of all, the colours used are very chic. Grey, silver and stone—the way to go if you want to achieve a house that exudes subtle classy style from the get go. These colours all merge into one another, white becoming grey, grey becoming stone, and are finished off with silver trimmings in the form of balustrades and door handles. The silver is like the icing on the already trendy cake! The architects have worked hard here to create depth and texture throughout the exterior. How have they have achieved this? By designing different volumes and shapes, which contrast and complement each other, they have created a true three-dimensional architectural masterpiece that pops ! Going into the kitchen, we can see how the sophisticated and elegant look and feel from the outside transcends throughout the interior. The kitchen is dominated by white and silver, which keeps the light, bright and clean look going strong. Don't you think this breathes new life into the kitchen space and maintains a gorgeous, minimalist look? 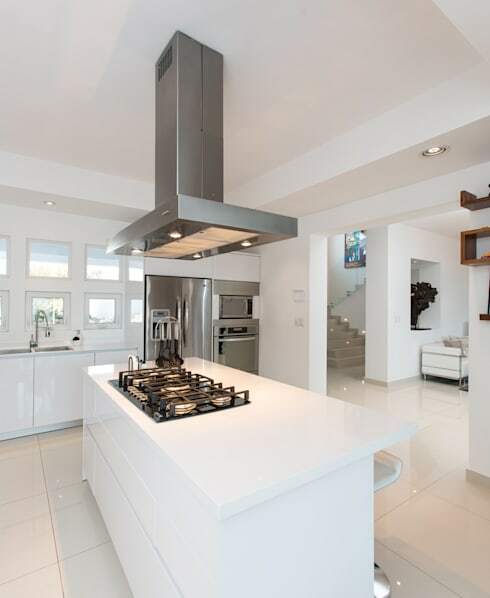 The kitchen counters and cupboards are sparkling white, which works well with the sleek silver appliances. You'll notice that there isn't a lot of clutter on the kitchen counters—everything is carefully stored away in the cupboards and drawers. This is a great tip when it comes to a kitchen space and something you should do in your own house to create a minimalist and neat looking room. You'll also notice that the kitchen is well-lit both naturally and artificially. You want your kitchen space to feel clean, breezy and light. You want to be able to see exactly how well your meat is cooked or that you've fried your mushrooms just right! You can achieve the perfect amount of light by installing dimming lights in your kitchen. Also opt for large windows and skylights, if possible. 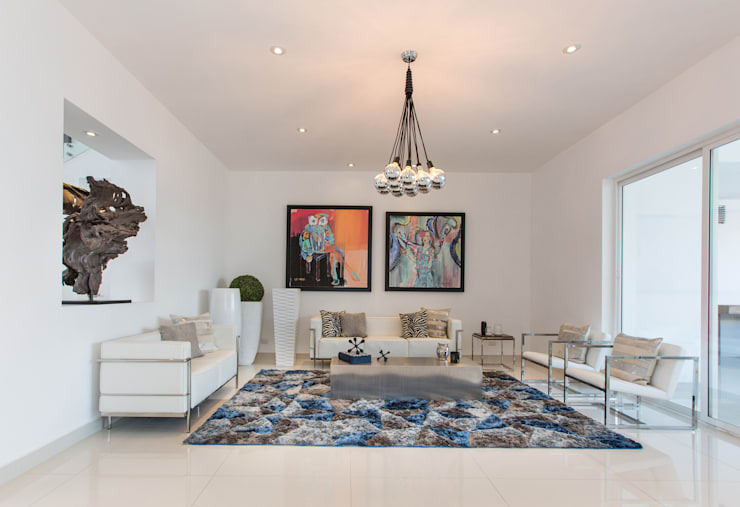 The white and silver theme continues throughout the interior, but takes an interesting twist in the living room. White is introduced here in the form of white walls and floors as well as gorgeous white furniture. Don't you think this creates a very trendy, stylish look? Silver comes in lightly in the form of finishes throughout the room. But the designers have now introduced a beautiful blue hue in the form of a silver and blue rug, silver and blue cushions and blue ornaments and accessories. It looks a bit like an ice palace. But then the designers have taken subtle style to the next level, by bringing in two paintings that are soft, colourful and abstract. If you saw all of these elements separately, you would never guess how wonderfully they would work together, which just goes to show how important it is to have a designer who knows what they are doing. If you think that you have an eye for style, check through the homify living room products for inspiration for your own house. 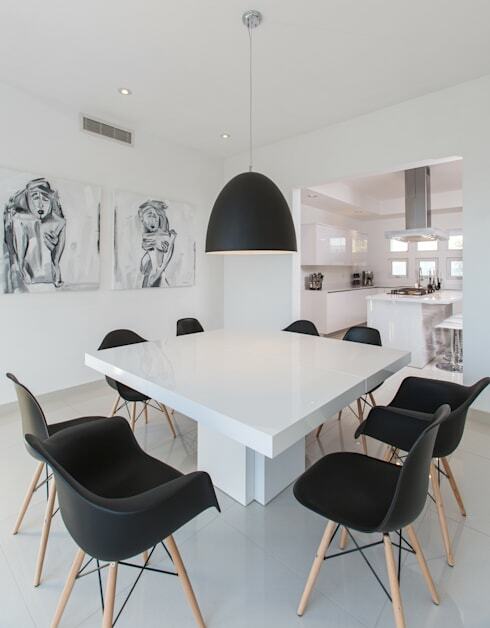 The dining room is just as sleek as the rest of the house, where a chunky white dining room table is frosted with slick black dining room chairs. These match the modern lampshade, which hangs over the dining room table. No matter what style of dining room you have, an overhead light like this one is a great choice. It can create ambiance and atmosphere while you have guests over and sets the perfect mood during dinner. The black and white theme here matches the black and white paintings that hang on the wall. Don't you love the way everything ties together in this space? You'll also notice that the dining room flows off from the kitchen. This is an open plan home where spaces are fluid. This is a very modern and trendy take on a family home, allowing for a far more social environment. You can keep an eye on the kids no matter where they are in the house! This more casual living room is a slightly more relaxed take on the living room that we looked at earlier. Grey couches are lined with puffy grey cushions, while blue, white and silver remain dominating colours, albeit in a more casual format. The rug is one of the first things that catches your eye in this room—dynamic and bold with strong shapes and colours. Don't you love it? It works so incredibly well with the solid, white coffee table, which is modern and sleek. The chandelier is the next piece to admire in this space—expansive and elaborate. It seems to take over the entire room with its beautiful soft light (similar to fairy lights) and its long arms. 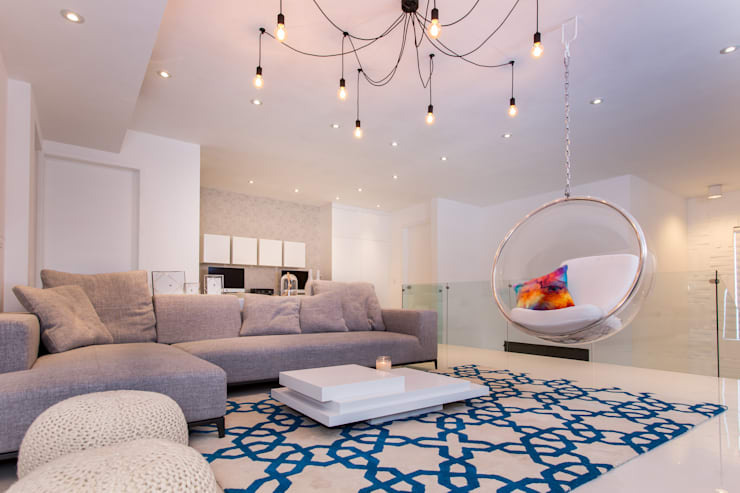 If you're looking to add something a bit different and trendy to your living room space, we recommend having a chandelier installed. It just adds that extra touch! Last, but certainly not least, we come to the impressive glass egg chair that is suspended from the ceiling. Chic, fun and funky, this is the pièce de résistance of the room. It is finished with a cushy white chair cushion and a colourful little pillow. Everything about this screams modern magic! The bedroom is a wonderful, homely cocoon where warm and a soothing colours have been used. 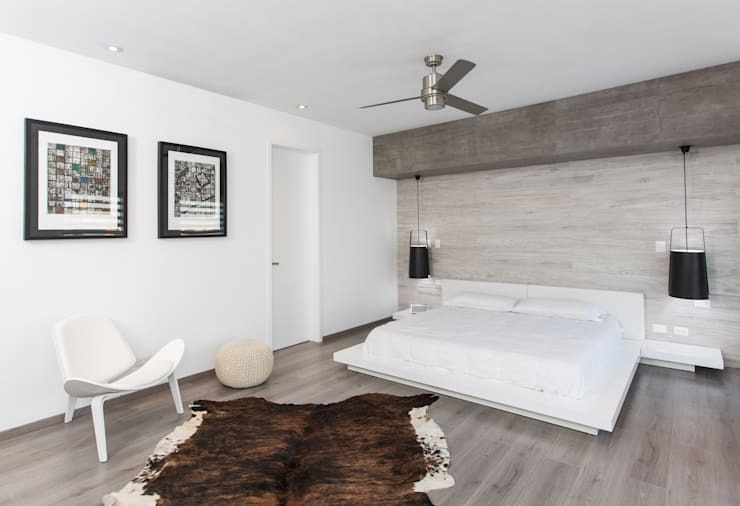 The wooden floors and wall are offset by the white furniture, linen and walls as well as the subtle use of black in the form of picture frames and lamps. This simple, neutral furniture and art has been carefully emphasised by a animal print rug and a stone sculpture in the room. The overall look and feel is a very natural, earthy and rustic space. The cool crisp linen is the ultimate pull factor for us. It seems like the bed is begging us to snuggle up into it! This is also a space where Mom and Dad can hide from the kids and share some quality time together. The back garden is the perfect family spot, with lush green grass and beautiful trees. You can play cricket with the kids, kick the ball around and even build a swimming pool if you're really feeling adventurous. The patio is our favourite part of the whole house. It flows out from the interior of the house, where cool sleek tiles make for the perfect space for entertaining guests. There is a wonderful braai area on the one side of the patio, while patio furniture decorates the rest of the space. On summer days, you can enjoy champagne, cheese and crackers or strong coffee and books while relaxing on the patio. This is the ultimate family home for anyone who enjoys both comfort and modern sophistication. Space, style and class are the winning factors here. If you enjoyed this house, we know you'll also love: The Contemporary Home for a Modern Family.